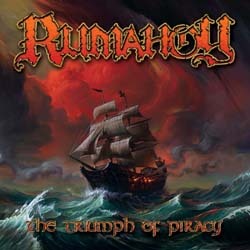 Scottish pirate metallers Rumahoy have unveiled the first details of their upcoming album, including title, track listing, available formats, pre-orders and YARRRR! Their first full-length studio album is entitled “The Triumph of Piracy” and will be released on February 9th 2018 via Napalm Records! Bustling pagan metal riffing mixed with exotic ancient instrumentation. Beware of dancing peg legs when Captain Yarrface asks for a fervent “Forest Party” and hook into each other and sway to and fro until your parrot goes overboard. Rumahoy produce melodies that run like the swell of stormy seas. The rough and rugged chants of their sea chanties will have you shivering. If pirates can sing about “Netflix and Yarr” you can sing along as well with Rumahoy. Believe it or not: Pirates are real. And you cannot escape. Captain Yarrface, the band’s founder and vocalist unveils: “Ahoy landlubbers! It’s time to drink some rum, fire a gun, and sail the high seas in search of pirate heritage and gold! Yarr! Join our crew, and together we’ll quest for a new pirate age on our debut album The Triumph of Piracy“! Apart from the digital formats, “The Triumph of Piracy” will be also released in standard edition jewel case CD, which is already available for pre-order in Napalm Record’s official web-shop, together with “T-shirt + CD” bundle. Load all of your gun barrels and light them up as Rumahoy have teamed up with their label mates and pirates in Alestrorm to hit the seven seas for a stormy tour in the UK early 2018.